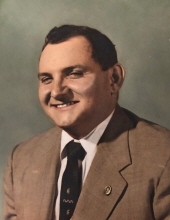 John Paster, 90, entered into eternal rest on April 11, 2019. Born and raised in Bayonne, NJ, he was a resident of Cranford for 60 years. Family and friends are invited to visit Thursday, April 18, from 10:00-11:30 AM at the Dooley Funeral Home, 218 North Ave. West in Cranford. A funeral service is being held at 11:30 AM at the funeral home. John was a proud Army combat veteran of the Korean War and was a member of the VFW. He worked at the Jersey Journal newspaper as a printer for 36 years before retiring in 1993. John was a member of St. Thomas the Apostle Church in Rahway for 60 years where he was a part of the Holy Name Society, the Church Choir, and worked bingo every Monday night. John was an avid Giants fan and season ticket holder since 1956. He attended three Superbowls (1986, 1990, 2000) where he cheered his beloved Big Blue on to two Superbowl victories. He was also a fan of the Yankees, Rangers, Knicks, and loved watching golf and rooting for Tiger Woods. John was an excellent bowler and enjoyed bowling in his Friday night league and in a youth adult league with his children. His highlight came when he bowled a 722 series one night. The news even made the local paper. He was predeceased by his wife Justine, brother Michael and parents Michael and Mary. Surviving are his children John Paster, Marianne Paster Geib and husband Michael, and Thomas Paster and wife Sharon. His loving grandchildren Kayleigh, Amanda, Annmarie, Marina, Taylor, Allison, Jeremy, Nathan, Sydney, and great grandchild Eric, along with numerous other relatives and friends. To send flowers or a remembrance gift to the family of John Paster, please visit our Tribute Store. "Email Address" would like to share the life celebration of John Paster. Click on the "link" to go to share a favorite memory or leave a condolence message for the family.